Bed Configuration is as follows: Bedroom #1 Floor: Entrance and lower level - One Queen Size Bed, Bedroom #2: Floor: Entrance and lower level (6 Beds)2 Bunk Beds with lower level Fulls and Top Bed Twins, 1 Loft Bed Twin and underneath, 1 Futon Full, Bedroom #3 Floor: Second Level, Master Bedroom Queen Size Bed, Full Bathroom attached, Bedroom #4 Floor: Second Level, One Queen Size Bed, Bedroom #5 Floor: Third & Top Level, Master Bedroom Queen Size Bed, Full Bathroom attached, Bedroom #6 Floor: Third & Top Level, One Queen Size Bed, Entrance Level has also, a Sleeper Couch, Futon Single Bed and a Frongate Automatic Inflatable Queen Size Bed. I'm Ken! I've been on this mountain for 38 years, and love it more every year. Stratton Mountain is the closest premier Ski destination to the New York Metropolitan Area. Stratton offers a multitude of amenities, both winter and summer....most of all the best skiing in Southern Vermont! no ski-in or out, but short drive to mountain, approximately 5 minutes. this spacious home is 4,000 sq ft on three levels, providing separate living spaces, two dining areas, four decks, parking for eight cars, very comfortable, indoor 10 man hot tub room, two kayaks provided. Great house for large groups and close to the mountain! We (14 adults) rented this house for a weekend ski trip this winter. The house was as described in the listing and true to the pictures. The kitchen is well stocked with the cooking essentials, the house was clean, bedding and towels (including for the hot tub) were provided, plenty of dry firewood was pre-cut and stocked inside to keep the fire going all night! The owner was informative, attentive, and excellent to interact with. Overall our group enjoyed the house and had positive reviews all around. We would certainly come back!! As mentioned in some of the other reviews, the driveway is somewhat steep but the driveway was plowed and salt/sand put down. We were able to get all the cars up (and down) the driveway with no issues though. Thank you for your great review. Your group was very respectful of our property and you are welcome back anytime! We had 3 families fit comfortably in this great house. Especially loved the big hot tub and the fireplace. This is an absolutely amazing home! We truly felt as though we had borrowed a house from family as opposed to renting it from vrbo. Ken was a gracious and accommodating host and was extremely responsive and thoughtful. We had absolutely no complaints and hope to rent the home again in the future. To describe the layout of the house a bit, the entrance level has the big green couch room you see in the photos (which is extremely comfortable and has a great TV), as well as a bedroom with a queen bed (pictured with a pink comforter) and the bunk bed room. The second floor, has an eat in kitchen with a large table, plus a formal dining room, 2 bedrooms with queen sized beds (one with an on suite), the hot tub room and a full bathroom. The upstairs has 2 more bedrooms each with queen size beds (one with an on suite), a full bathroom and yet another living room (which overlooks the hot tub). The kitchen is fully stocked with anything you need to make cooking very easily! The house is also extremely close to Stratton Mountain, about 5 minutes, which is another added plus! The only thing I would mention is the driveway is a bit steep so car’s with 4 wheel drive have an easier time getting up it. I highly recommend this home to anyone staying in Stratton! We were a group of young adults and had a fantastic stay here. A lovely home with plenty of space to relax, unwind and also socialise throughout our stay. Plenty of rooms for sitting around (separate living room, TV rooms, and a great sized dining room for eating or board games). House was extremely tidy, and well maintained and the owner was very helpful and attentive to any of our needs. Would recommend to all groups! Many rooms in this place. Fantastic convenience and views of the mountain. Ken is a great guy who is accommodating and friendly. There are enough beds and bathrooms to go around. Many living rooms allows for great relaxation. Great mud room for skiing that keeps the rest of the house clean. The house is far enough from other neighbors that you can have a private stay. 1) bunk room is small, but legitimately holds six people fairly comfortably. 2) steep driveway, so make sure you have four wheel drive if going in the winter. Plow was responsive, however. I highly recommend this house and hope to return. We had a great weekend! Comfortable home for couples. We stayed with 4 couples and had a great time. Some people enjoing the upstairs with puzzle and games. Others downstairs with a great TV. Nice dining room and table for gathering at dinner. Kitchen with many utensils, dishes, and glasses, Wine, martini, etc. Nice hot tub to relax in. Might be warm in the summer. 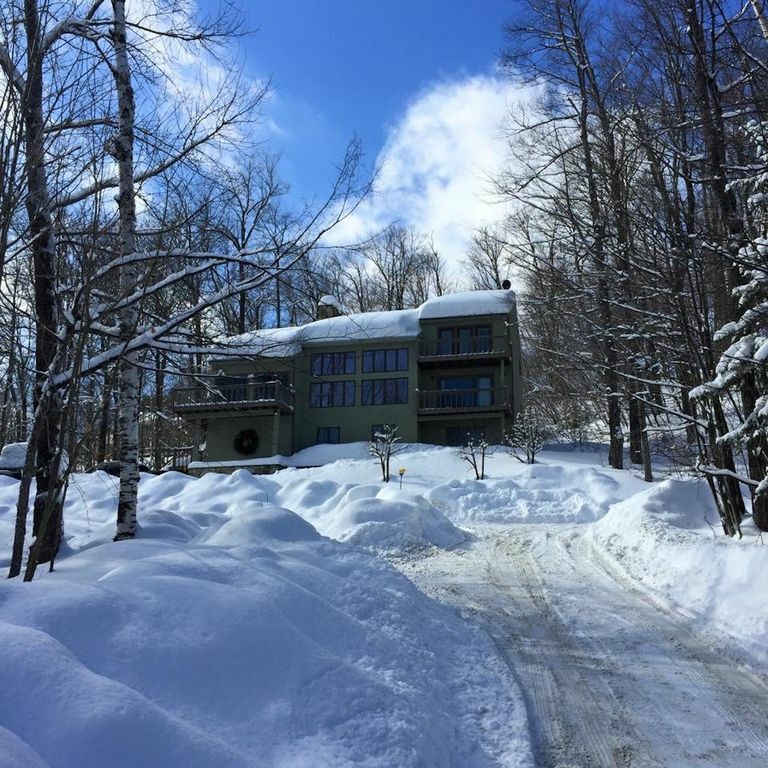 Very close to Stratton mountain and close to Manchester for shopping.